Australia might not be the first country anyone associates with tailoring and classic menswear, but Melbourne has a greater range than most of the rest of the country. This is partly due to the fact that it has clear seasons, with a few weeks where something more than a T-shirt is definitely required. And partly down to the culture of the city, which is commonly referred to as the most European in Australia. There are many galleries, shops and (especially) cafes in which to wear more style-conscious clothing. Melbourne’s remote location also means there are more independent shops, which makes it perfect for this series. Although most of the designer brands have branches, it’s easier for home-grown brands to set up and find a local following. The worldwide resurgence of crafted menswear has also led to an increased interest in local tailors, shirtmakers and shoemakers. For classic menswear, perhaps the finest store in Melbourne. Established by brothers Chris and Nick Schaerf, Double Monk’s main focus is shoes, but it also offers hats, socks, ties and leather accessories. The shoes are mostly Northampton-based English makers like Edward Green and Crockett & Jones, but there is also Alden, Carmina and Saint Crispin’s. A beautifully outfitted store with felt-and-wood shelves and rolling ladders. Now with a branch in Sydney as well. Christian has his roots in classic menswear and tailoring, but has found himself adept at designing versions of these pieces that suit a more casual and relaxed Australian aesthetic. An online brand for several years, he opened his first store in Melbourne in 2017, and has established a strong local following. There are unlined jackets and lightweight shirts, alongside sneakers and handkerchiefs that Kimber designs himself based on different cities. An independent store catering to all types of workwear, Pickings & Parry carries the likes of Nigel Cabourn, Buzz Rickson and Old Hands. 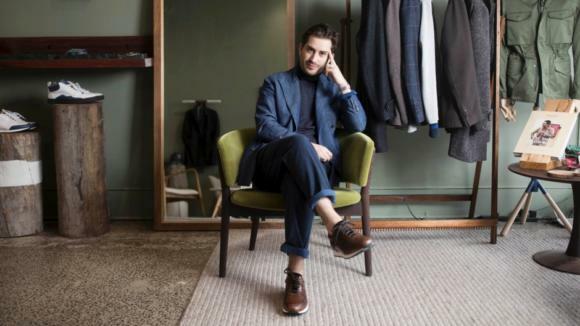 Although the style might be different, the philosophy of good clothes that last well is common to shops like P&P and Double Monk, and is something that goes down particularly well with an Australian audience. Also good for workwear is Godpseed, which specialises in Japanese denim and is the only Australian stockist of The Real McCoy’s. Masons is an independent multi-brand store that aims for a luxury audience – but mixes styles between tailoring, high fashion and streetwear. Traditional makers like Fox Umbrellas and Lock & Co hatters sit alongside Visvim and Vivienne Westwood, and just across from Jil Sander and Dior Homme. Although led by such brands, there is also more of a focus on customer service than at many designer stores. P Johnson may not be an single-shop brand, with stores now across Australia, the US and UK, but it is a good reflection of Australian style. The made-to-measure tailoring has always been very lightly made – often in pale, earthy colours – but its most recent ready-to-wear collections take this a step further, with linen shirt-jackets and drawstring trousers, in camel or navy. Worth a visit when the more traditional menswear seems a little too heavy for the 40-degree sun. There aren’t many bespoke shirtmakers in Australia, but Charles Edwards in Melbourne has one of the best reputations. Located on Crossley Street, just behind American Tailors and Maimone (both bespoke tailoring), Edwards cuts to original paper patterns and is pleasingly non-digital, not even having a basic website. Tolley are perhaps the best of the small scattering of bespoke tailors in Melbourne. Certainly they’re one of the most modern. Interestingly they own an old Savile Row brand, John Morgan & Co, and offer a bespoke suit that is made in Australia (three in-house tailors) alongside one made by Savile Row coatmakers in the den of 11 St George St. Other old-school tailors include American Tailors, Pino Curcio and Eugenio Nicolini. These are both bespoke shoemakers, Wootten being the old-school name and Roberts & Hassett the newcomer. Jesse Wootten runs his shop, which was founded by his father, who in turn was trained by Bulgarian maker George Koleff. They do bespoke shoes but largely machine sewn in a blake or blake rapid construction. They can also do hand-stitching but it’s a small part of the business. Roberts & Hassett are young bespoke shoemakers just doing traditional bespoke, with hand welting, hand-stitched soles and hand-built heels etc. They are particularly known for exotic and local leathers, such as kangaroo. Perhaps the two names most worthy of mention for made-to-measure suiting are Oscar Hunt and Steve Calder. Oscar Hunt is a big operator, doing the largest MTM business in Melbourne. It has in-store tailors for some finishing but the suits are largely made in China. Steve Calder is an ex-Zegna man who offers the only MTM made in Naples, and stocks several brands Permanent Style readers will be familiar with, such as Craftsman Clothiers, Cham Prrom and TBD sunglasses. Trunk Tailors also does a nice MTM suit, which is measured in Melbourne but made in Hong Kong. Harrolds is a department store (three in Australia) with the usual range of designers such as Tom Ford, Brioni and so on. They are beautiful stores, though, and perhaps some of the best put-together anywhere outside Japan. Worth a walk around. As ever, interested to hear readers’ views and favourite places in Melbourne. Many thanks to the various people, customers and writers who contributed to this piece. You can follow the discussion on Melbourne: A sartorial shopping guide by entering your email address in the box below. You will then receive an email every time a new comment is added. These will also contain a link to a page where you can stop the alerts, and remove all of your related data from the site. Great selection thanks Simon, I can personally vouch for four of those mentioned. I might add Henry Bucks to the mix as well. A well established (120 years) off the rack and MTM boutique with a recently refurbished store on Collins st in the CBD. English and Italian brands (Barbour, Drake’s, LBM 1911, Canali, Sunspel). Worth a visit. Thanks. All recommendations and personal experiences very welcome. It’s worth adding that Melbs is very oriented towards small/single location artisans of all types, and this perhaps reflects the growing interest in “one off” menswear producers and retailers. I am a very frequent visitor as my eldest daughter lives there, and this focus spreads equally to the food/restaurant/bar culture. To this extent, a global coffee chain tried to set up its network there a few years ago, but the locals stayed with the many one of a kind coffee boutiques that abound, and the result was a retreat which saw many of the chain outlets closing down. Well worth a visit; in my view one of the best cities in the world. .. and now the newest on the scene – Modern Classic Shop; just opened on the weekend taking Picking & Parrys original location. Excellent selection of great brands from around the world! Henry Bucks use to be good, but unfortunately they are nowhere near what they use to be. Quite sad actually, lucky if they will be still open in the next year or so.. I just went in this past weekend and couldn’t believe how great the store looks. They’ve completely redone their suit department and they have their own in house label with Dormeuil, Zegna, and Loro Piano fabrics. I picked up a jacket and trousers for less than a $1000. Also worth a mention is Up There. Not so much for the classic suits crowd but lots of interesting brands not available elsewhere such as Snow Peak, Orslow, Kapital and more. Well worth a visit. Kimber’s store is great and the area is well worth a wander – not far from The Modern Classic, Pickings and Parry and The Standard Store. In the city, PJT, Calder and American Tailors all worth a visit. Very pleased to see Melbourne featured. If you had told me that when I moved here 10 years ago I doubt I would have believed you. Hi Simon, who makes the jackets in the first picture at the top please? Great to see this city guide series is still going; don’t suppose you have any plans to do one for Madrid? Speaking of which, I’m moving there in a week’s time so any tips from Madrid-based readers (sartorial or otherwise) much appreciated! Wow! Hope it goes well. Rome as well please! There is a huge huge huge amount there, it just hides under the surface! I’m a long time admirer of your blog, but am amazed at how much knowledge you have acquired in such a relatively short time of writing, so I’m tempted to ask the question. Hey Paul. No I haven’t. My brother lives there, but the information was really built on interviews with a dozen people in the menswear world in Melbourne (writers, customers, shop owners). Simon did cover several of the Madrid tailors a while back. This is marvellously timed as I am moving from London to South Australia in June. My current (limited) wardrobe consists of well-structured (Graham Browne @&c.) +13oz worsted with tweed and cords at the weekend. What should I prioritise in order to transition to a much hotter, and more casual, environment? People often ask you about a particular product or brand and you often reply that you can’t advise them as you haven’t experience of them. How do you reconcile that position with writing a whole piece about a number of shops and brands which you have never visited? I try to stick to that rule, but it’s largely with bespoke artisans where personal experience and personal fit are so central. Shirt sleeves and open collars on first inspection – but I’ll be in a leadership role. Any recommendations for RTW trousers in a ’10 best for SS18′? When this article came on your site i did not ‘open’ the article as i felt it had little interest for me as the main image was not attracting me. Today i did open the image and roared with laughter as the bottom o fthe image is then shown. Most people would think it is only for a photo shoot but those models with no shoes! What is the point of trying to look decent and wear no shoes i ask? Strangely enough it is not just for a photo shoot as I was in Australia last year and was appalled by the sloppy dress code and no shoes attitude which i witnessed in so many large towns throughout Australia. It was quite frankly off-putting. So to see this article and realise that is how Australia markets itself made me laugh – thank you for brightening my day! Whilst not unique to Melbourne, or even Australia these days, I think RM Williams could be worthy of a mention. Their boots are iconic, and a great match with jeans and chinos. Melbourne is still the clothes making capital of Australia although sadly, most of it has gone off-shore. Agree with Tim that Henry Bucks has lost its mantle and probably Harrolds has taken over albeit, with Italian made clothes predominating. Generally Australian dress code has fallen markedly especially in cities outside of Melbourne. Suits sans ties are the norm. I reckon Melbourne/Australian women’s designers such as Collette Dinnigan, Bettina Liano, Sass & Bide, Camilla & Marc, Alice McCall, Manning Cartell and Zimmerman are far more interesting than the Australian men’s designers. I haven’t lived in Melbourne for 13 years, so I am probably out of touch, but it was rare to see anyone dressed in decent menswear even in the height of winter. I do however still have a lovely Harrolds tie which is still going strong after all these years. As an aside, I grew up in country Victoria and, as recently as the 1980’s the “RM Williams” man, would visit with his van to deliver orders or take new ones, occasionally he would have things in stock in his van. A light blue chambray shirt, light brown moleskin trousers, a dark brown belt, dark brown RM Williams and, occasionally, a nice Akubra was the country gent’s uniform. With regards to the top image, what is your view on wearing suits with no shoes? Duly noted. I ask only due to the fact I have a beach wedding coming up and I was wondering what to wear shoe wise and no shoes seemed to be the way forward. Do you know if any tailors are coming to/ planning to come to Australia for trunk shows? I feel like Australia has been ignored for most of the time when tailors are considering holding trunk shows in overseas. Why is the case? Mostly because it’s a long way away and expensive I’m afraid. It’s also not that large a population. I have had may Tailors ask this whilst in Italy etc. It has to be worth it for the Tailor to come here, so there are minimum costs involved and as Simon has said it is quite a HIGH cost to them especially if they don’t make their minimums…. Hi Simon, I live in Melbourne for the moment, and I just want to know if you been to tolley, American tailor etc and have a look at their product? I’m seriously thinking about getting a bespoke suit made, just want a safer investment, which bespoke tailor have the best quality of them in your opinion? Thanks.